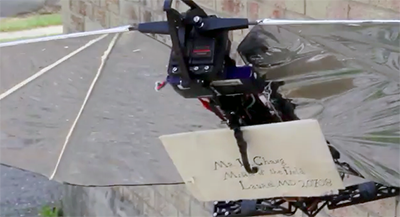 In this still from the latest Robo Raven video, the UAV's new claw grips an important letter to be delivered to a waiting 'Hogwarts' student. The University of Maryland’s bio-inspired unmanned air vehicle (UAV) Robo Raven has been making waves ever since it was first introduced in April 2013. Along the way, Robo Raven gained solar power and a searchlight for night missions. It’s been chased by hawks and even found itself included in an exhibit of outstanding design in a French art museum earlier this year. Now in its fifth evolution, Robo Raven V is a hybrid platform that uses both propellers (like an airplane) and its flapping wings to fly. The new propellers provide extra thrust which in turn leads to much higher lift forces. Also, compared to the original model, Robo Raven V has improved its aerobatic ability and can carry significantly higher payloads. This added capacity means Robo Raven V can incorporate a notably larger battery to increase its flight endurance or carry much more sophisticated sensors. The Robot Raven project is led by Professor S. K. Gupta (ME/ISR), director of the Maryland Robotics Center; Professor Hugh Bruck (ME) and their students. The Robot Raven team will be presenting three technical papers at the ASME Mechanisms and Robotics Conference in Boston on Tuesday, August 4, 2015. To demonstrate Robo Raven V’s higher payload capacity, the team recently added a claw that can grasp objects and release them in flight. Watch a demonstration of Robo Raven delivering a letter like Harry Potter’s owl Hedwig in this Hogwarts-inspired video.